Zapfish (Japanese: デンチナマズ Denchi Namazu) are creatures that appear in Splatoon and Splatoon 2's Hero Modes, Octo Valley and Octo Canyon. The player must rescue one at the end of every level in order to proceed in the story. To take the Zapfish, the player must burst its shield with ink like the Rainmaker's shield. Then they must touch it and the screen and music will change to say that they have passed the level. There are different types of Zapfish in the game: normal Zapfish are small, approximately the size of an Inkling's head; the more powerful and much larger Great Zapfish provides enough electricity to power Inkopolis. Normal Zapfish are held captive by bosses in each world, while the Great Zapfish is held by the final boss, DJ Octavio. Zapfish, electric catfish, are the main power source of Inkopolis. Through an Inkopolis News broadcast at the start of both Splatoon and Splatoon 2, the player learns that the Great Zapfish has been stolen and taken to Octo Valley and Octo Canyon respectively, both places being a hidden underground base used by the Octarians. The player is guided by Cap'n Cuttlefish and must rescue all the Zapfish in order to restore Inkopolis' power supply. A Zapfish is found at the end of every level in Octo Valley, enclosed in a glowing sphere of electricity and sitting on a light bulb-esque pedestal. The player must shoot the sphere with ink until it bursts, releasing the Zapfish. If it is not grabbed after some seconds, a new bubble will form around it. There is a doll version of a Zapfish when completing a mission that had already been cleared. It is made out of wool, has googly eyes and some stitches patched, it also wears a blue cap made from wool, representing Cap'n Cuttlefish's Legendary Cap in which the Zapfish itself does not wear. The animation for obtaining the Zapfish also changes, having Agent 3 and Agent 4 holding the doll differently. Zapfish appear to be a cross between a small fish and a light bulb's filament. They have a large head with two small eyes, two nostrils, and a pair of orange lips. Below the head is a smaller, yellow body. Mini Zapfish only appear in Octo Canyon inside Octoling missions. There are a total of eight Mini Zapfish scattered across the map in each mission and it is Agent 4's job to collect all of them. It is stated by Marie that all eight Mini Zapfish combined have the power output of one normal Zapfish. In the Octo Expansion, Zapfish are replaced by a different goal, which has a thin, silver, pencil-like design. They are the way for Agent 8 to complete levels that task them to get to the goal. They function the same way as a Zapfish, with bombs exploding instantly if they touch it. Similarly, data points replace Mini Zapfish, which appear in groups of eight. These only appear in two levels, being Bodacious Rotation Station E11 and Cubular Station F10. It is shown in credits art that Cap'n Cuttlefish is the one who makes and sews the stuffed Zapfish dolls. Zapfish in the Octarians' spheres are surrounded by electrical charges, likely indicating that they are generating power. All sub weapons that come into contact with a Zapfish's shield will explode instantly, similar to the Rainmaker's shield. The Japanese name, denchi namazu, means "catfish battery". Similar to electric eels, some catfish produce an electrical discharge to defend themselves. The Great Zapfish swims in the water surrounding Piranha Pit, and can be seen coming up to the surface in Turf War when the timer reaches one minute. In Shellendorf Institute, there is a display showcasing the development of a Zapfish. There is an object in the Octo Expansion called the Energy Core which looks like a red spherical Zapfish. The Zapfish dolls can be found laying around Cap'n Cuttlefish's cabin in Octo Valley, as well as one found in the waste container in Inkopolis Plaza, standing beside the entrance to Octo Valley. A Mini Zapfish doll can be found lying under a pillow on a sofa in Tentakeel Outpost. Agent 3 holding a rescued Zapfish. Agent 3 patting a retrieved Zapfish doll. The Great Zapfish, curled around Inkopolis Tower. Concept art of a Zapfish with some Power Eggs. Concept art of a stuffed Zapfish with a real one. Concept art of a small Zapfish, possibly a baby. Agent 3 holding a Zapfish and a doll version. Promo art of Marie and a Zapfish doll for the Pokémon Red vs. Green Splatfest. A render of a Zapfish from Splatoon 2. A mem cake of a Zapfish from the Octo Expansion. 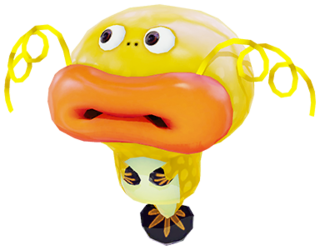 A mem cake of a Mini Zapfish. A Mini Zapfish doll inside a barrier. Mame Denchi Namazu Miniature battery catfish. This page was last edited on 11 April 2019, at 15:57. This page has been accessed 51,774 times.